SAN FRANCISCO--(BUSINESS WIRE)--In May 1984, two young comic book artists, Kevin Eastman and Peter Laird, self-published the first Teenage Mutant Ninja Turtles comic, unaware that their creation would soon become an international phenomenon. Almost 30 years later, the Turtles are more popular than ever with Nickelodeon’s hit-animated TV series Teenage Mutant Ninja Turtles and Paramount Pictures Teenage Mutant Ninja Turtles, a highly anticipated theatrical movie hitting theaters this summer. Written by Andrew Farago, Teenage Mutant Ninja Turtles: The Ultimate Visual History (June 2014 / $50.00 / Insight Editions) is the complete, never-before-told story of the Teenage Mutant Ninja Turtles—from their humble beginnings in black-and-white comics created in a home studio to their multimillion-dollar breakout success and their enduring status as four of the most beloved cultural icons of all time. 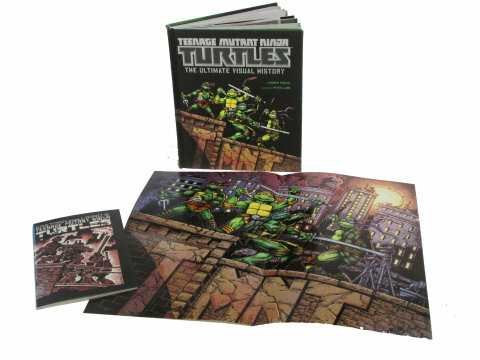 The book also features interviews with key players in the Turtles revolution, including co-creators Kevin Eastman and Peter Laird, animation legend Fred Wolf, creature effects maestro Brian Henson, and even the man behind the “Ninja Rap,” Vanilla Ice. Bringing together the rarest art and artifacts from three decades of Turtles comics, television shows, and films, Teenage Mutant Ninja Turtles: The Ultimate Visual History explores each iteration of the Turtles from past to present, including the hit-animated series from Nickelodeon and the Michael Bay–produced movie from Paramount Pictures starring Megan Fox and Will Arnett. Andrew Farago is the curator of the Cartoon Art Museum in San Francisco and the author of The Looney Tunes Treasury. He has also written for Marvel Comics, The Comics Journal, and Animation World Network. He lives in Berkeley, California, with his wife, cartoonist Shaenon K. Garrity. Insight Editions (www.insighteditions.com) is a publisher focused on creating superlative illustrated books on photography, music, and popular culture. Lavishly produced and visually stimulating, every volume from Insight is dedicated to the skillful interplay of word and image. The books produced are unique works that combine the highest quality print production values with time-honored traditions of publishing and rich subject matter. Elegant and informative, books from Insight showcase the best of art and photography in exquisite presentations of the bookmaker’s craft.